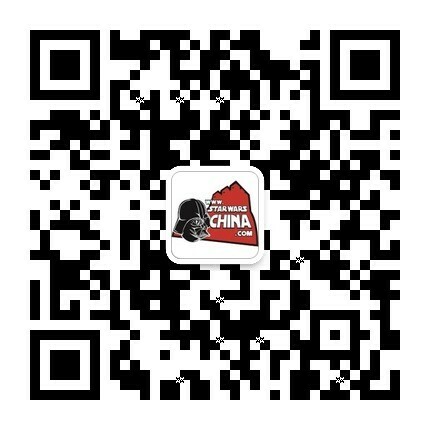 ﻿﻿ 昆兰·沃斯（Quinlan Vos） - Databank - 星球大战中文网 Star Wars China - Powered by Discuz! It's for good reason that the Jedi Code dictates that initiates into the Order are brought in during infancy. The tenets of the Jedi are repeatedly reinforced during a Padawan's training, to diminish any possibility of transgression into the dark side's seductive grasp. But what happens when a Jedi loses his memory? Thus was the fate of Quinlan Vos, a young Kiffar from Clan Vos discovered by the Jedi. The tightly knit clans of Kiffu at first did not want Vos to leave his home. At a very young age, Vos showed prodigious psychometric talent -- he could read the tenuous psychic imprints left by living hands on inanimate objects. A Kiffar that displayed such abilities usually served his people as a Guardian -- a local law enforcer that protected the sector of space wherein the twin planets of Kiffu and Kiffex reside. Quinlan's parents, Quian and Pethros, were both Guardians, and members of the influential Vos bloodline. Kurlin Vos, the Sheyf (or leader of the Guardians), proposed a compromise to the Jedi. Rather than take Quinlan away to Coruscant, he would be trained at home. The Jedi Council agreed, and Master Tholme became Quinlan's mentor in the ways of the Force. At a very young age, Quinlan lost his parents when they were brutally murdered by the vampire-like Anzati. The Sheyf's sister, Tinté, who had long disapproved of Jedi meddling in the Guardian ranks, wanted to taint Quinlan with a taste of the dark side. Knowing that fear was a gateway to the dark path, Tinte brought Quinlan his mother's Gaurdian emblem, worn at the time of the murder. At Tinte's request, Quinlan used his psychometric abilities to read the emblem. The young boy experienced his mother's murder first hand. For three days he screamed in horror. Only Master Tholme was able to calm the boy, using Jedi meditative techniques. He had no choice but to remove Quinlan from Kiffu, to take him away from the shifty Tinte. On Coruscant, Tholme helped Quinlan to overcome his deep-rooted fear of the Anzati, and to continue along the path of the Jedi. The Guardians wished greatness for Vos, though privately they hoped he would hold Kiffu first in his heart, and the Jedi second. Quin returned as often to Kiffu as his Jedi duties allowed. Some Jedi frowned upon such sentimentality; they emphasized detachment from personal pasts in favor of devotion to the Force. After achieving Knighthood, Vos took a Padawan, a young Twi'lek girl named Aayla Secura. Quin and Aayla were drugged and robbed of their memories while investigating a glitteryll smuggling racket on Nar Shaddaa. Left to die on the Smuggler's Moon with only fragments of his past, Vos still had the power of the Force under his command, but none of the discipline. This made him very vulnerable to the beckoning call of the dark side. An unscrupulous Devaronian bounty hunter named Vilmarh Grahrk teamed up with Vos to help the ailing Jedi escape from a host of enemies on Nar Shaddaa. Grahrk provided transit to Ryloth, where Vos discovered his mind-wiped apprentice, Aayla. The once proud Padawan had been reduced to a lowly slave, toiling away for her uncle, Pol Secura. Vos was furious, and tortured Pol until he revealed the name of the glitteryll mastermind, Senator Chom Frey Kaa. Had it not been for the intervention of Jedi Master Mace Windu, Vos would surely have committed an act that would have sent him to the dark side. Vos voyaged to Coruscant to kill Senator Kaa, but Windu stopped Vos in time. Quinlan was welcomed back to the Jedi Order, and he underwent retraining. Still, he possessed a dangerous instability and would on several occasions skirt dangerously close to the darkness. Very soon into his rehabiliation, the Jedi Council dispatched Quinlan Vos on a dangerous mission to the quarantined world of Dathomir. The evil Force witches on that forbidden world had uncovered an ancient temple of incredible power. Crafted by an ancient, extinct species, the Star Temple contained an Infinity Gate -- a dimensional portal capable of generating destructive waves of spatial disruptions across the galaxy. Matriarch Zalem, the ruler of a dominant clan, sought to excavate the temple and target Coruscant with a devastating infinity wave, but Quinlan was able to thwart her with the unlikely aid of her daughter, the witch Ros Lai. One of Quinlan's next missions brought him home. Tinte, now a Sheyf, specifically requested Vos to investigate a massacre at a security compound on the prison planet of Kiffex. Little did Vos know that he was stepping into a dark chapter of his past, and a world stained by the ancient power of the dark side. Hidden on Kiffex was a Dark Jedi, imprisoned in stasis for a millennium. Volfe Karko was once a powerful Jedi, who succumbed to his Anzati heritage and became a dangerous predator. Consumed by his hunger for blood, Karko turned against the Jedi. He was defeated, and locked in stasis, but his mind remained active. He became an underground legend to other Anzati, who turned his resting ground into a sacred temple. They came to worship at the feet of the Dreamer, proclaiming themselves his spiritual children. Though completely immobile, Karko was able to sap the essense of the Anzati, slowly degenerating them into savage, feral shadows of their previous forms. The seductive call of Karko beckoned to young Aayla Secura. The amnesia-addled Padawan had voyaged to Kiffex to seek out her former master, but instead found Karko's sepulcher. The frozen Dark Jedi lured Aayla to his tomb, and had her deactivate the stasis shield. She became his pawn in his bid for power. As the feral Anzati "children of the dreamer" ravaged the neighboring prison settlements, Karko waited patiently for more Jedi to come into his reach, so that he could drink from their life essence and grow in power. Quinlan Vos knew none of this as he set foot on Kiffex. Master Tholme accompanied Vos, to keep an eye on him and judge his performance and rehabilitation. Tholme told Quinlan about his parents' fate, and explained to him the source of his deep-rooted fear of Anzati. It was a crucial test for Vos. He had to confront the specter of his parents' murder and not give into fear or darkness. Vos' Jedi resolve withstood the test. He was not only able to defeat Karko, but also free his Padawan from the Dark Jedi's grip. Aayla's memories returned to her, and mentor and apprentice were finally reunited. Master Tholme agreed to re-train Aayla, but Quinlan needed time alone, time to follow where the living Force willed him to go, and time to discover his true role as a Jedi. Though he had recovered much of his former Jedi discipline, the dark side continually haunted Vos. His aimless wanderings often tugged him to the galaxy's fringe, and on several occasions he found himself paired with the unscrupulous Vilmarh Grahrk. Despite slippery loyalties, Villie proved a helpful ally to Vos on numerous occasions. After a year of journeying throughout the galaxy, Quinlan had made scores of enemies. Greedy bounty hunters had completely surrounded Quin on Ord Mantell when Aayla Secura again sought him out. Their mentor, Master Tholme, had been captured by deadly Morgukai warriors, and was held captive in the desolate wastelands of Kintan. 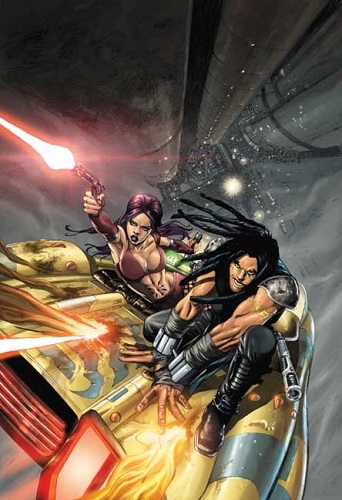 Aayla and Quin voyaged there and did battle with the Morgukai, narrowly defeating the determined Nikto fanatics. For her exceptional display of skill and determination, Aayla was promoted to the rank of Jedi Knight following this incident. Quinlan continued wandering, though as a Separatist movement led by Count Dooku began to gain momentum, he found himself with a new mission. Aided by Master Tholme, Quinlan amassed a network of spy contacts within the Separatist movement. Quinlan's network, however, failed to provide any advance warning of the trap on Geonosis, and Vos felt shame for not being able to prevent the death of so many Jedi at the start of the Clone Wars. When the Jedi were promoted to Generals in the Clone Wars, Quinlan opted to stay in the shadows, gathering needed intelligence. His cover was Korto Vos, an ex-Guardian gun-for-hire. At the Wheel space station, he was able to uncover evidence of the Confederacy attack on Kamino. This allowed the Jedi enough time to bolster their defenses at the battle than ensued. After months of operating undercover, Quinlan failed to make contact with the Jedi Temple. Jedi Master Agen Kolar was dispatched to bring Vos back, armed with disturbing evidence that Quinlan had actually betrayed the Republic. Rather than fencing bogus holocomm codes to the Confederacy, it appeared that Vos was actually selling legitimate intelligence to the enemy. Kolar confronted Vos on Nar Shaddaa, but the Jedi spy refused to return to Coruscant. He repeatedly cited his distrust of the Republic, and it appeared that Quinlan had indeed switched sides. Constrained by diplomatic tensions between the Republic and Hutt Space, Kolar was unable to continue pursuit, and Vos fled deeper into the shadows, and deeper into the Confederacy's folds. Quinlan's character design came from a background extra glimpsed in Episode I, during the Mos Espa sequence that introduces Sebulba. 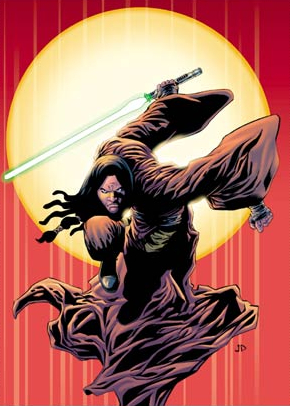 Quinlan has starred in several story arcs of the ongoing Star Wars comic series from Dark Horse Comics.